I run an historical museum in Concord, Massachusetts—where, as you can guess, there’s a lot of history. Less than I year ago I hired Abby Kimball to run our school education program. It was kind of spur-of-the-moment—the former education director left suddenly, and Abby came with a strong recommendation from a guy I used to date, Ned Newhall. Well, all right, who I almost married. We parted ways amicably, and I do trust his judgment. I even found Abby a place to stay temporarily, house-sitting for some friends of mine, while she got sorted out after breaking up with her ex, the one who dragged her to Massachusetts in the first place. I was even okay with it when she started seeing Ned, practically gave her my blessing. He’s a great guy and I want him to be happy. And then things got weird. During one of those school breaks that drive working parents crazy, I had to ask Abby to keep an eye on my daughter Ellie, who’s seven. I know—not appropriate in the workplace, but I was desperate. Abby didn’t mind—she likes working with kids, since she ran the children’s programs for the museum. At lunchtime they took a walk in Concord and ended up in a nearby cemetery (there are times when I don’t quite get Ellie’s idea of fun—the cemetery was her pick, not Abby’s). And that’s where things fell apart. Ellie comes back and tells me that she sees ghosts, and she’s been seeing them for a while but was kind of afraid to say anything to me. Abby encouraged her to talk to me, which was the right thing to do, even if I didn’t want to hear what Ellie had to say. But I got scared—and mad. And I fired Abby. Okay, that wasn’t fair. It’s been a couple of months now, and the more I talk to Ellie, and watch her, and listen to her, I realize that maybe there’s something going on with her that I don’t understand—but Abby does, because she sees the same people (or former people or non-people, or whatever they are). Now Ellie is insisting that she wants to see Abby again, and while I may not like it, I do understand why. That means I’m going to have to eat crow and let Abby back into our lives, much as I hate to do it, while we figure things out. For Ellie’s sake. If you want to know what happens next, there will be another book in the Relatively Dead series shortly (but it doesn't have a name yet!). Abby and Ellie are going to explore what really happened at Salem in 1692. I'm not overly fond of paranormal stories but you are making this sound very interesting! Sheila, you know I love your books, all of your books! I just wish I could find this one in any of our local county libraries. Because you are you, I will very likely bite the bullet, go down into the dungeon and open the safe to extract enough money to buy a copy of this book. So there, now you really know how much I love your writing. I love cemeteries, I began my love for them when I went with my grandparents to help keep a small cemetery of my grandfather's relatives, plus a few more people. He would mow the lawn and my younger brother and I picked up sticks (along with my grandmother) to make sure they were not in the way of the mower. After that we ran around and looked at the tombstones. I was intrigued bu all the infant and childrens' tombstones as these deaths were not common to me. Almost all had a little lamb sitting beside or engraved on the tombstone. There were others with fantastic epitaphs. An old school teacher that taught many students in that portion of the city had a school house looking tombstone and his said "Schools out the teacher has gone home." There were no ghosts haunting this cemetery. :;) I have an e-copy of your book and will read it soon. My poor nook is dying and I will not replace it until I can buy a decent tablet and download the app. Oh, good, I'm not alone. My mother claims I learned to walk in a cemetery, in Red Lion, Delaware. I don't remember it. And I attended a Quaker school in Pennsylvania, where my first-grade class was housed in what had been a one-story stable, and it had a cemetery behind it. My middle school in New Jersey did too. Hmm, I see a pattern here. I find it hard to go by any cemetery without stopping to look, and that includes in other countries. I figured those buried are glad for the company. I enjoyed reading Relatively Dead very much. 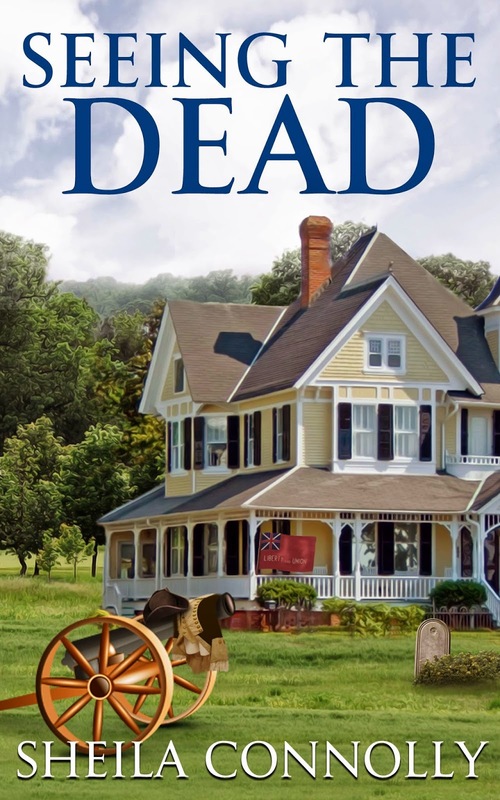 I look forward to reading See the Dead. It is on my thr list. When I was little my mom would often take me to Forest lawn Cemetery (Buffalo, NY). We'd have picnic lunches there and feed the ducks. It's a beautiful cemetery, and like all Victorian cemeteries was designed to be enjoyed by the living for just such purposes! I'm not at all familiar with this book-I'll have to look for it! It was a rather peculiar Victorian idea of entertainment, wasn't it? Pack a lunch, pick a bench, and contemplate your mortality. Is that better or worse that having a picnic overlooking a Civil War battle? I'm so glad to hear that there will be a new book in the series.